That is German for “spritz” as in “cookie”. I think most of us are familar with this cookie from childhood. The recipe consists of basic ingredients, including staples such as flour, sugar, butter, and eggs. You can change the flavor by adding various extracts such as vanilla, orange, almond, etc. The term “spritzgeback” actually means “to squirt”. I remember trying a cookie press when I was in my 20’s. It was a great tool when you wanted to mass-produce cookies during the holidays. I liked the uniformity of the cookies, but it lacked character and a challenge. So I decided to combine my love of baking cookies with my favorite kitchen tool: the pastry bag. I use pastry bags almost every day in my kitchen – from piping French Macarons ( in my sleep!) to filling some of my sandwiched cookies. Once you get a feel for piping, you tend to develop a rhythm, and uniformity in your cookies becomes apparent after much practice. Although the spritz cookie is considered German in origin, it originates from the region of Alsace – which is bordered by Germany, Switzerland and France. German and French influences can be found here, as well as both languages being spoken, but where French dominates. The spritz cookie dates back to the 16th century, Medieval Period. The texture of the spritz cookie is slightly crisp, buttery and mildly sweet. It pairs well with fillings when sandwiched together. So how do I combine the German recipe with a French influence? That’s where the pastry bag comes in. I decided to make the dough, keep it room temperature (so it piped easily), and use a star tip nozzle in my pastry bag. A few swirly turns later on parchment paper, and the lovely “German Rosette” was created. 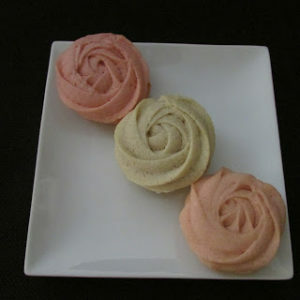 I offer 3 rosette cookie flavors: raspberry (medium pink), rose water (light pink), and vanilla bean. Fillings can be either almond or vanilla bean, both of which meld well with any of the cookie flavors. Sandwiched together, they make a lovely presentation.